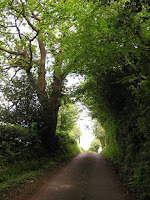 "What book have you read that makes you feel as if you've been on a the journey that the narrator has taken?" Julie Lawson Timmer asked on Reddit. A good question for finding good books. My own personal favorite is Bound for the Promised Land by Richard Marius, a story of a young man who leaves his home in Georgia for San Francisco in the 1850s, in search of his father who left for the Gold Rush, and the many characters he meets along the way. And I'm grateful that a commenter mentioned Fear of Beauty. It's an honor to be included with the likes of The Count of Monte Christo, Heart of Darkness and The Goldfinch. "Charitable giving may have created an incentive for governments to pursue budget cuts in every area, then replacing paid librarians with volunteers or relying on charities during major disasters. 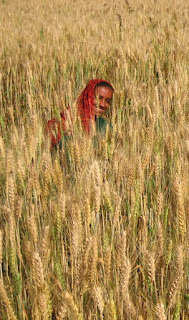 'Although it is the world’s largest private philanthropic organisation, the Bill & Melinda Gates Foundation, founded in 2000, spends just over $3bn (£2.25bn) a year on development assistance,' reports Kate Hodal for the Guardian, adding this is "one-tenth of the US aid budget and almost one-fiftieth of the global aid budget, which stands at $143bn." Charitable giving and work is wonderful, but no one should forget that individuals set the agenda. They have reasons and, with limited funds, they select the recipients. This is opposed to governments which presumably have a responsibility to the public at large. Theoretically in democracies, the public selects representatives who set agendas and priorities. Charitable work, often experimental, can teach governments about best practices. Yet for this very reason, the thousands of charities operating in any country often have contradictory goals and diverse approaches. As Gates notes, charity can provide only patchwork relief. Complete coverage of a nation or the globe by charities in tackling major needs - whether health care, education, or poverty alleviation - is impossible. Limited funds and uneven goals lacking in comprehensive coverage have transformed charity into a lottery - where nations and donors can tout a few good schools, hospitals, libraries, homes or more while many more must go without. Yet the challenges of illiteracy, disease or marginalization, as noted in Fear of Beauty, can quickly cross borders and can hurt us all. 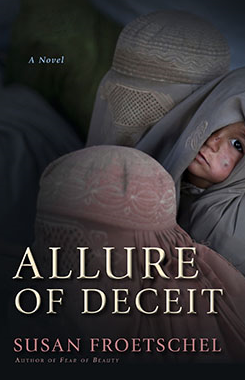 Both Fear of Beauty and Allure of Deceit focus on the many contradictions of charitable giving and NGO work in Afghanistan, specifically with family planning and poverty. A woman who leads the world's largest foundation, taking control after the death of her son, targets program planning to figure out why he was murdered. Staff members of the foundation are intent on nurturing their own careers while supporting a mission in Afghanistan that includes family planning - reducing the fertility rate from about nine children per woman in 2000 when the Taliban were in control to five. 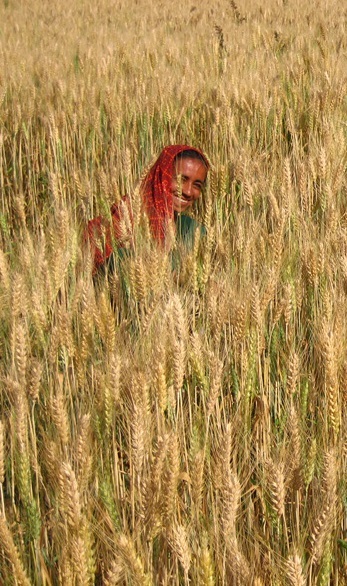 Values clash, and Afghan providers who are recipients of international aid - torn between the demands of rural village leaders and international donors - are resented, prompting them to commit fraud. Amid the flow of so much money, it becomes dangerous for anyone to argue that charities reinforce inequality or suggest that the public must set priorities after thorough review with taxation as the best funding mechanism. Emphasizing government funding over charitable giving does not let individuals off the hook. In a connected world, we must lend a hand to others in need. And efficiency is required with limited resources and more communities in need. Donald Trump Jr's release today of an email exchange is stunning on many levels. The exchange suggests he understood that Russia wanted to support Donald Trump's presidential campaign with damaging information about his opponent Hillary Clinton. Younger Trump, along with Jared Kushner and Paul Manafort, then campaign manager, met with a Russian attorney proffering the information in June 2016. 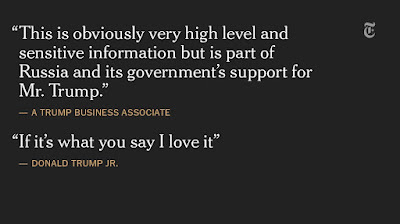 After the meeting was proposed in an email, Donald Jr's response was quick: "If it’s what you say, I love it, especially later in the summer.” The response suggested he had little doubt about the type of support and few concerns about the source of such opposition research. The lawyer, wanting to help the campaign, insinuated that Russians had been funding and supporting the Democratic National Committee, but had no proof. Trump Jr noted that the lawyer was "vague" and "made no sense" with "no meaningful information." He did not alert authorities like the Federal Bureau of Investigation. Instead, he and perhaps the other two took it upon themselves to determine the information was meaningless. By all accounts, this is a clown show, and we may not ever really know all what was said during the meeting. The US president's response, according to a statement read by the deputy White House press secretary: "My son is a high-quality person and I applaud his transparency." 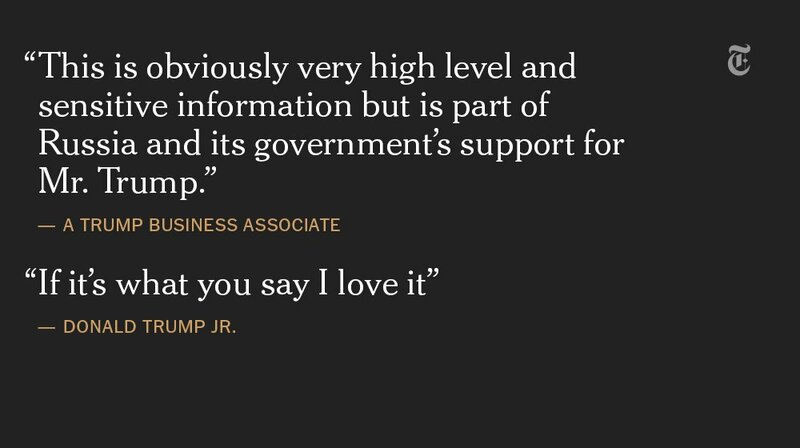 The statement resonates with sarcasm considering that Donald Jr has revised descriptions about the meeting several times and is among Trump campaign officials, some who still work for the US government, forced to revise lists of meetings with foreign nationals. Collusion, election fraud, lying to American voters should not be a surprise with this young presidency, not after the wearying campaign. What is surprising is that Donald Jr released these emails himself, as if he saw nothing wrong. As US Senator Mazie Hirono put it on Twitter, "When @realDonaldTrump said show us the evidence of collusion, I have to say, I didn't expect his son to answer." One who may be a party to the patterns of a possible crime - a growing list of events being investigated by Robert Mueller and congressional committees - should not be praised for transparency after rushing to beat reporting by the New York Times. This is neither a track record of competence nor "high quality" - a disturbing and tasteless phrase, one that signals division, otherness, marginalization, insecurity and reflects troubling policy proposals that target large groups of people like Muslims and immigrants. Another son, Eric, echoed such a sentiment about Democrats during an interview: "I've never seen hatred like this. To me, they're not even people. It's so, so sad. I mean, morality is just gone. Morals have flown out the window. We deserve so much better than this as a country." "We are living in a volatile political environment. You know, to just be grossly generalistic, you could put half of Trump's supporters into what I call the basket of deplorables. Right? The racist, sexist, homophobic, xenophobic, Islamaphobic - you name it. And unfortunately there are people like that. And he has lifted them up. He has given voice to their websites that used to only have 11,000 people - now 11 million. He tweets and retweets their offensive hateful mean-spirited rhetoric. Now, some of those folks - they are irredeemable, but thankfully they are not America." Her remarks included another age-old signal - "Right?" - so often alerting skeptical and doleful listeners to the possibility of discriminatory words and feelings that will only cause woe to the one who dares utter them, even if only once, even though followed by swift apology. Back to "high quality" people, a phrase that suggests that some people for are innately better than other people and deserve more - money, leeway, chances, support, opportunity to complain, cut corners, make mistakes, cheat and lie. There are better descriptors. Consider an article by Forbes - "5 qualities of charismatic people: How many do you have?" The qualities: self-confidence, including optimism; the skill to tell stories; body language that is open and approachable; relying on conversation about others and being a good listener.Those who assign labels like "high quality" may think that only they can decide rules, who must follow and need not, when perpetrators should be exposed and punished or forgiven. Those who use the phrase are insecure, desperate to be regarded as better of others, deserving of a higher standard of justice even while they make mistake after mistake after mistake. And this is a pillar in intervening and disrupting medical decisions for British infant Charlie Gard, diagnosed as terminally ill by his doctors - assuming this represents kind, magnanimity and justice - blind to any contradictions with policies blocking thousands of refugee families from Syria many with their own infants. Russia intervened in the US presidential election, and the United States was conned, a reflection of many voters' failure to follow the news and apply critical thinking and logic to wild populist claims designed to infuriate without delivering viable solutions..
As Nicholas Kristof notes for the New York Times, it is a sad day for the country. It's also a sad day for democracy and the globe. 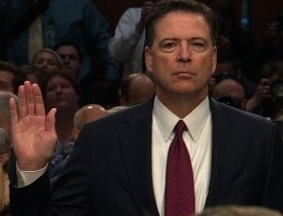 History and our system of government were on display during the US Senate Select Committee on Intelligence hearing with testimony by former FBI director James Comey.For the most part, committee members were serious, prepared and non-partisan - provided numerous powerful moments as role models for all citizens. A key point to emerge from Comey's testimony: The US intelligence community reported with high confidence that Russians meddled in the US elections, with the release of false news and attempts to breach state electoral systems. US President Donald Trump has dismissed these reports. But not Comey, who testified: "... we’re talking about a foreign government that, using technical intrusion, lots of other methods, tried to shape the way we think, we vote, we act. That is a big deal. And people need to recognize it." Our response to Comey's testimony and ongoing conduct in Washington DC will shape our system for years to come. Do we want the young, our future leaders, to learn that lying, bullying, manipulation, false narratives and framing, obsequiousness in the workplace, misplaced priorities and loyalties are normal? Joe Manchin, senator from West Virginia, was thoughtful: "what details of this saga ... should we be focusing on, and what would you recommend us do differently?" Comey's response: "I don’t know. I - and one of the reasons that I’m pleased to be here is I think this committee has shown the American people, although we have two parties and we disagree about important things, we can work together when it involves the core interests of the country. So I would hope you’ll just keep doing what you’re doing. It’s - it’s good in and of itself, but it’s also a model, especially for kids, that we - we are a functioning, adult democracy." One of the great challenges of parenting is to raise children with integrity, critical thinkers who strive to do what's right even when the powers over us - whether political leaders, corporations or elders in our family - do the opposite. 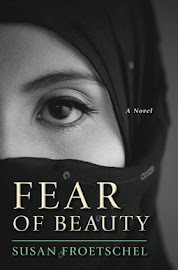 Fear of Beauty, set in Afghanistan, examines the dilemma for parents at the local level as extremists with bullying ways move into the small community, trying to whip up anger against a nearby American outpost. It offers lessons in recognizing the extremists in our midst. Some are belligerent, bullying and obvious con men with endless promises. Others are more subtle. Both types try to attack strong education systems that promote independent and critical thinking. They fear new ideas, the comparisons and choices, and even curiosity and questions. They promote the importance of a few individuals over the comment good. They employ distractions and whip up irrational fear. Among the young, they rely on favoritism and resentment to train others to be followers of twisted ideologies. And they lie repeatedly and expect others to support these lies. 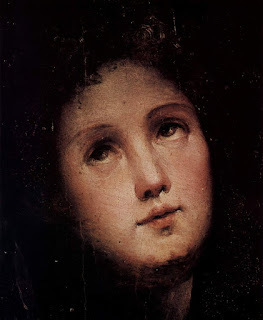 Sofi, the protagonist in Fear of Beauty and mother who yearns to learn how to read, resents a the belligerent militant intimidating her remote village in Afghanistan, and she realizes that transparency is crucial: "In plan sight, the man could not commit evil." As a woman, her opinion carries little weight and she hunts for ways to resist, concluding there is "no doubt that obeying a tyrant like Jahangir, his evil plans and ruthless control of others, is as much a crime as devising those plans." Sofi comes to realize that children learn if their society offers comparisons that can be observed and studied - what systems, people, attitudes and approaches work best and produce the most good in daily life. Sofi may be illiterate, but her children never have any doubt about her values and opinions for the extremists in their village - and the villages who collude with them - as a dangerous threat. And Comey stresses the same and points to why Russian leaders fear democracy; "It’s not about Republicans or Democrats. They’re coming after America, which I hope we all love equally. They want to undermine our credibility in the face of the world. They think that this great experiment of ours is a threat to them, and so they’re going to try to run it down and dirty it up as much as possible. That’s what this is about. And they will be back, because we remain - as difficult as we can be with each other, we remain that shining city on the hill, and they don’t like it." 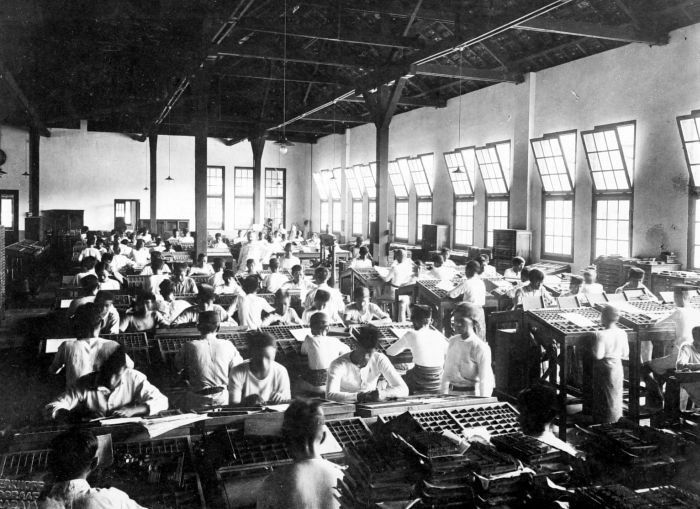 "The organization’s great strength is that its values and abilities run deep and wide. The FBI will be fine without me. The FBI’s mission will be relentlessly pursued by its people, and that mission is to protect the American people and uphold the Constitution of the United States.... this organization and its mission will go on long beyond me and long beyond any particular administration.... I want the American people to know this truth: The FBI is honest. The FBI is strong. And the FBI is, and always will be, independent." It's a warning to any who seek to subvert justice and deny truth. Constituents pay a price for leaders who try to avoid opponents and news that criticize their plans and policies. This is old hat for those in live in dictatorships, but it's new for the citizens of the United States and the United Kingdom. Former Prime Minister David Cameron made a terrible mistake allowing last year's referendum on whether Britain should leave the European Union to proceed. He thought the Remain camp would win handily and this would be politically expedient for the Tories. Misinformation surged, notably that less money for EU membership would mean more funds for the National Health Service. The Leave side won and Cameron resigned. Theresa May became prime minister, and over-confident about her abilities to negotiate a decent Brexit package, refusing to listen to valid concerns, called for a snap election. The woman who set the date for this election suggested she had no time for debate, and criticizes her opponents for their criticism. Poor planning, misunderstanding public concerns, a lack of appreciation for the European Union, and arrogance are leaving British people with uncertainty and a flailing economy. And then there is Donald Trump, whose campaign is being investigated along with Russian interference during the 2016 US presidential election. He will announce today whether the United States will stick with the Paris Accord, a voluntary agreement negotiated by more than 190 countries to reduce reliance on fossil fuels and combat climate change. Trump promised during the campaign that he would withdraw from the Paris agreement, promising that the United States could do better by taking its own lonely path, relying on dirty coal rather htan developing clean alternative energies. More than 95 percent of all legitimate researchers, many businesses, most countries view climate change as a serious economic, security and environmental problem. By withdrawing, the United States will trigger a backlash. People around the globe will protest and boycott the country for rejecting what is both sound research and common sense. Too many politicians, once in power, try to live in bubbles. They avoid critics, blame the media for raising legitimate questions. They fear open debate and town halls, hoping their contrary ways will go unnoticed or eventually be accepted by weary voters. But so many in the world seek leaders who emphasize cooperation. Those who want to go it alone should prepare for a global backlash. 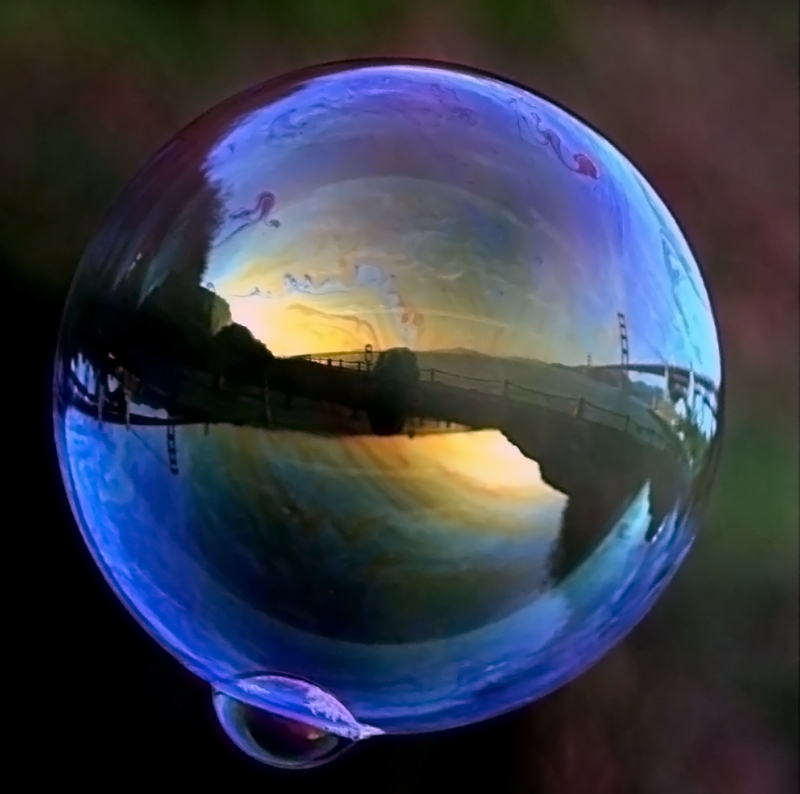 Photo of bubble, courtesy of Wikimedia Commons. 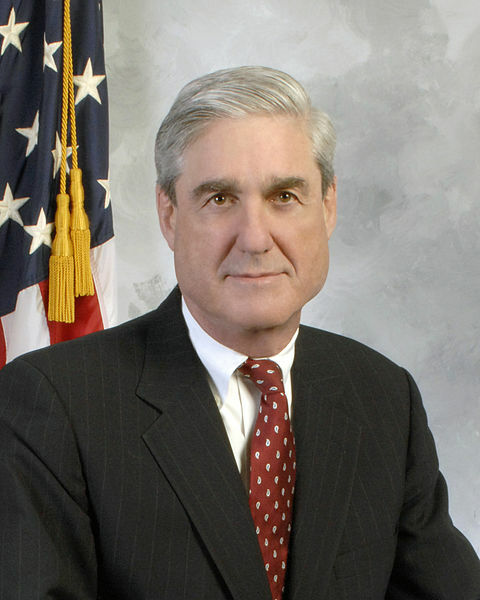 Robert Mueller, former director of the Federal Bureau of Investigation, has been appointed as a special counselor by US Deputy Attorney General Rod Rosenstein "to ensure a full and thorough investigation of the Russian government's efforts to interfere in the 2016 presidential election." A sense of relief is sweeping throughout the country that a professional investigation will pursue the rattling claims of disruptions to US democracy. US intelligence officials earlier released a report concluding that Russia was behind leaks, and a stream of fake news aimed at interfering in the US presidential election, specifically to benefit Donald Trump over Hillary Clinton. The interference though the spread of outlandish stories was obvious and reported before the election. Yet most analysts underestimated the power of fake news in a developed nation, assuming that citizens with a basic education - 88 percent of US adults hold a high school degree and more than half with some college education - would apply critical thinking skills and ignore bizarre and unsubstantiated reports. 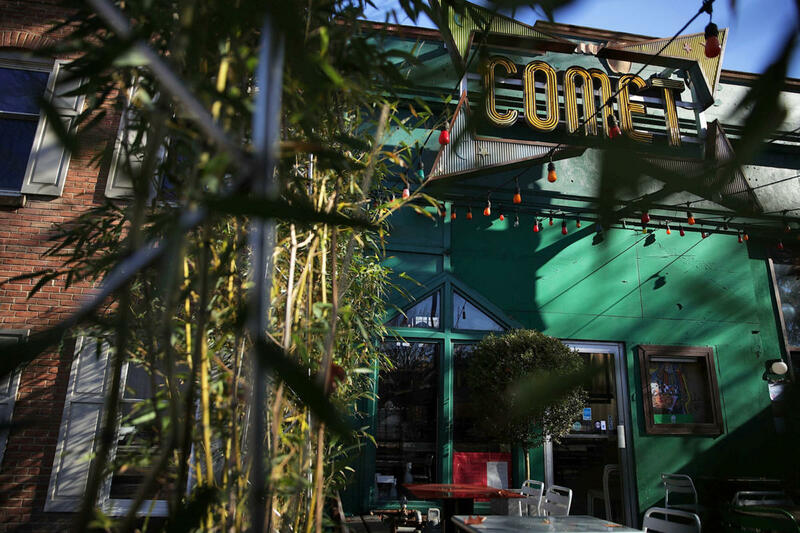 But no and a prime example was Pizzagate, a false tale that Clinton and her colleagues were running a child trafficking ring in various restaurants, including the basement of Comet, a pizza shop in Washington DC. The stories inspired a Carolina man to storm the store with weapons, firing shots and announcing he was there to save the children. The young man was arrested and pled guilty, and he will be sentenced in June. Far-right conspiracy theorists like Alex Jones of Infowars, who make a living by fomenting rage, pounced on the bizarre stories. Jones has since apologized. The investigation will proceed and follow complex financial trails, and in the meantime the motives of this administration are under a microscope: "An uproar has emerged with worries about politicized law enforcement, a US president installed by a hostile foreign power, who then goes on to oppose science and education initiatives that truly empower the United States while favoring the problematic coal industry over alternative energies and other policies that reduce US competitiveness. Russia supported Brexit to weaken the European Union, but failed in boosting far-right candidates in the Netherlands, Bulgaria and France. The United States may no longer be a trustworthy world leader, and even allies may doubt US motives until an independent investigation is pursued and the many disturbing questions are settled." We must be patient and vigilant in monitoring over US politics never forgetting that voters choose these leaders to work for all of us. 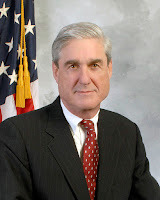 Photo of Robert Mueller III, courtesy of Wikimedia. The United States is moving ahead to allow internet providers to sell customer browsing history and related data - and the savviest internet users want to thwart the sell-off and warp the product. There are two approaches: block your provider from viewing data or overwhelm the provider with data. VPNs - or virtual private networks - block some of what the provider might see, and those with access to work or school VPNs are making a point of signing in every time they start to browse. "While VPNs are an important privacy tool, they have limitations," explains Klint Finley for Wired. "The most obvious: You need to trust your VPN provider not to track you and sell your data itself." The second approach is directing your browser to head to all kinds of bizarre internet sites. "Yesterday, the House of Representatives voted to let internet service providers sell your browsing data on the open market," explains Emily Dreyfuss, also for Wired. "This decision angered a lot of people, including programmer Dan Schultz. After reading about the vote on Twitter at 1 AM, he turned off Zelda and coded this ghost currently opening tabs on my machine." So I headed right for the little ghost machine that's called Internet Noise, clicked the button and watch a parade of nonsensical sites, one every few seconds: godmother soap, macrame basket, wood squeegee, silvar dollar blueberry, venom catamaran, the hyena, concrete option, porthole chest and on and on. Nothing too incriminating there for insurers, financiers, advertisers, campaign organizers or other creeps who want to accumulate, categorize and sell our data. The terms are certainly not as incriminating as those used to research my murder mysteries - especially the two set in Afghanistan, Fear of Beauty and Allure of Deceit. On the bottom of the bare bones Internet Noise page created by Schultz are five suggestions for protecting privacy: install https, donate to the Electronic Freedom Frontier, consider Tor or using a VPN, or install Privacy Badger. And don't forget to scream at your provider. Give them a call and find out what data they are collecting. Try to opt out - but don't trust them. More articles will be coming out about which providers offer the most privacy protections - and I doubt Comcast will make the list after donating to politicians to get this legislation passed. With luck, some providers may even discover that ensuring privacy offers a big competitive edge. 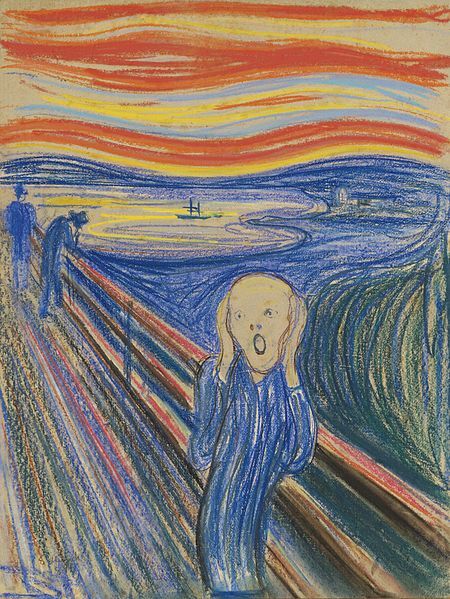 The Scream in pastel, 1895, by Edvard Munch, courtesy of Wikipedia Commons. Americans, always ready for a celebration, will don the color green and join parades and parties on March 17, to commemorate Saint Patrick, the patron saint of Ireland. Many who celebrate won't realize just how much the Irish were despised a century ago, suggests "The Wearing of the Green," an exhibition at the Eli and Edyth Broad Museum of Michigan State University. "Such eagerness to celebrate Irish cultural identity has not always existed in this country," notes the introduction. "During the pre- and post-Civil War years, Irish immigration reached unprecedented levels, and with this emerged the stereotyped image of the heavily accented, irresponsible, inebriated, quick-tempered 'redhead,' typically named Paddy or Bridget. 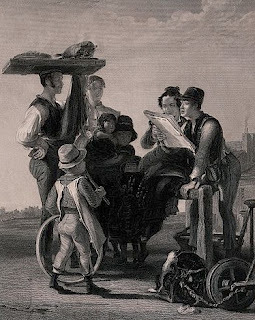 Supported by 19th-century social-scientific theories of evolution, and embodying conventional Victorian-American ethnocentric views, cartoons and caricatures further portrayed the Irish as childlike, apelike, or even subhuman." Old prejudices faded with time and Irish Americans also abandoned some traditions and assimilated. The earliest Irish immigrants were mostly Protestant who were followed by less wealthy Catholics. Ireland's population swelled in the 19th century, and by 1830, and limited land combined with unsustainable farming and tenant arrangements could not support the population. 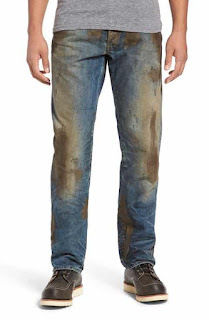 "It was the cataclysmic Potato Famine of 1845-1851, one of the most severe disasters in Irish history, that initiated the greatest departure of Irish immigrants to the United States," explains Brendan A. Rapple for Countries and their Cultures and Everyculture.com. "As many as 1.5 million individuals perished of starvation and the diverse epidemics that accompanied the famine. A great number of the survivors emigrated, many of them to the United States. From the beginning of the famine in the mid-1840s until 1860 about 1.7 million Irish immigrated to the United States..."
Rapple goes on to describe the stereotypes and cartoons of Irish as "pugnacious, drunken, semi-savages" - with widespread disdain for Catholicism, large families and a willingness to accept low wages in the face of prejudice. Cartoons disparaging the immigrants were common in the 1800s and early 1900s. "Produced for wide public dissemination, these images can therefore be understood as social barometers, providing glimpses into the American cultural scene of their day and the often negative stereotyping of various ethnic groups," notes the introduction to "The Wearing of the Green." Discrimination was blatant during the 19th century with "many ads for employment were accompanied by the order "NO IRISH NEED APPLY," explains Victoriana Magazine. "Nativists reacted to increased Irish immigration with violent riots and increased demands for limits on immigrants' rights. These nativist groups considered the immigrants as a threat and regarded the Catholicism of the Irish as an alien and rebellious religion and culture." Of course, the history of a harsh welcome for the Irish immigrants invites comparisons to receptions for modern immigrants and refugees, especially those fleeing the civil war in Syria. "In the Past Lane" recalls a time when Americans regarded some Irish immigrants as terrorists. The Given Day, a memorable novel by Dennis Lehane captures the mood about immigrant communities and anarchy in the early 20th century. Today, more than 32 million, or 10 percent, of Americans claim Irish ancestry, according to the US Census Bureau, and despite the surname, yes, I am one. More than 35 percent have completed higher education. "The world's first St. Patrick's Day parade occurred on March 17, 1762, in New York City, featuring Irish soldiers serving in the English army," notes Sean Dunne for Irish Central. The United States has more than 3.6 million people with Arab ancestry, which encompasses immigrants from Syria, Lebanon, Egypt, Palestine, Moroccan, Iraq, Jordan or Yemen and represents a little more than 1 percent of the population, reports the Arab American Institute. Like the Irish Americans, Arab Americans have a median income that is slightly higher than the nation as a whole, and 45 percent have completed higher education. Many Americans have learned from history and protest any form of discrimination. But not all. "We live in an era that has unleashed all manner of odious, racist rhetoric," writes Francine Prose for the Guardian. "The bar for what retains the power to shock us is being raised daily. But some comments still cut deep. 'Culture and demographics are our destiny. We can’t restore our civilization with somebody else’s babies,' said Iowa Representative Steve King over the weekend." King has since insisted that his comment was about "western civilization" and not race. He worries about a changing culture from the increasing numbers of Hispanics, Asians and other immigrants, too. A century ago, the Irish were "somebody else's babies." But the greatness of western civilization is epitomized by the regard for all humanity, regardless of where those people might live on this planet of ours. Especially here in the United States, we and our ancestors are someone else's babies. 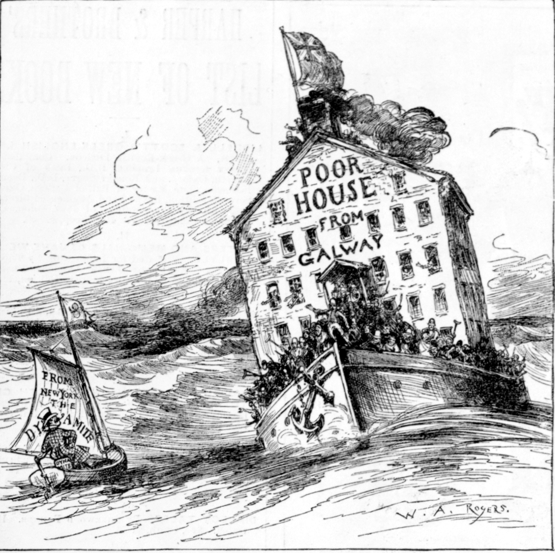 Cartoon of "poor house" of Irish immigrants, courtesy of Victoriana magazine. 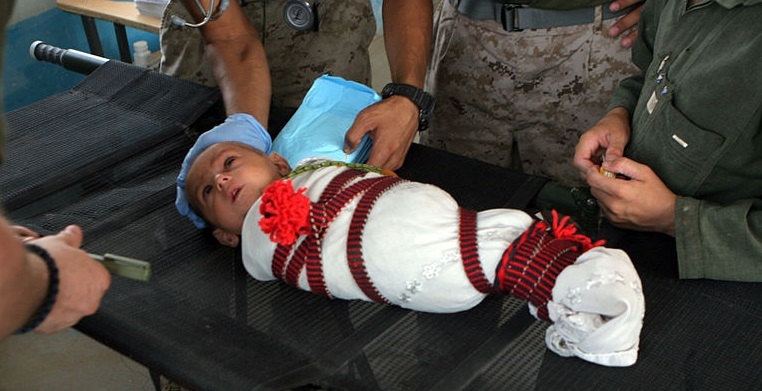 US Marines treat an Afghan infant in Delaram, courtesy of the US Marine Corps and Wikimedia Commons. Many of the more than 8,700 documents on CIA hacking tools released by WikiLeaks are technical. But not all. Among the files is a quick summary of Practices of an Agile Developer by Venkat Subramaniam and Andy Hunt, a book readily available on Amazon. The advice is timely and could be useful for any leader. Blame does not fix bugs. "Instead of pointing fingers, point to possible solutions. It is the positive outcome that counts." Negativity kills innovation... Take pride in arriving at a solution rather than providing whose idea is better. "There is no absolute best, only better. Despite the popularity of the term, there is no such thing as 'best practices,' only better practices in a particular situation." You definitely need to read this section for yourself - basically admit your mistakes and back up your opinions with facts (pros and cons). "Do what is right. Be honest, and have the courage to communicate the truth. It may be difficult at times; that is why it takes courage...."
Learn iteratively and incrementally. Get the latest buzz.... Read voraciously. "Keep up with changing technology. You do not have to become an expert at everything, but stay aware of where the industry is headed, and plan your career and projects accordingly." "Raise the bar for you and your team. Use brown-bag sessions to increase everyone's knowledge and skills and help bring people together. Get the team excited about technologies or techniques that will benefit your project." "One of the foundations of agility is coping with change. Given that change is so constant and pervasive, does it make any sense to keep applying the same techniques and tools you have always used?" Expensive mental models are not discarded lightly: "Learn the new; unlearn the old. When learning a new technology, unlearn any old habits that might hold you back. After all, there is much more to a car than just a horseless carriage." The best question to ask – Why ...? "Keep asking Why. Do not just accept what you are told at face value. Keep questioning until you understand the root of the issue." Agile projects have rhythms and cycles.... Time boxing – setting a near-term, hard deadline for an activity that cannot be extended. "Tackle tasks before they bunch up. It's easier to tackle common recurring tasks when you maintain steady, repeatable intervals between events." Quotable Quote – "In warfare, as in software development, the situation can change quickly and drastically. Sticking to yesterday's plan despite a change in circumstances is a recipe for disaster." Decide what you should not decide: "You do not want to have to make decisions that are business critical by yourself. After all, it is not your business." "Let your customers decide. Developers, managers, or business analysts should not make business-critical decisions. Present details to business owners in a language they can understand, and let them make the decision." Design should be only as detailed as needed to implement. Strategic versus tactical design – strategic is the up-front design before requirements are known "A good design is a map; let it evolve. Design points you in the right direction. 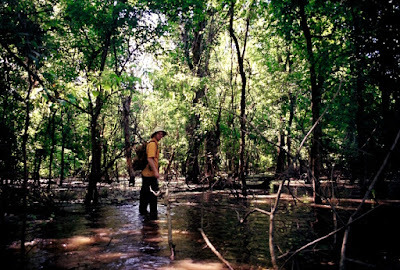 It is not the territory itself; it should not dictate the specific route. Do not let the design (or the designer) hold you hostage. "'No Big Design Up Front' does not mean no design. It just means do not get stuck in a design task without validating it with real code. Diving into code with no idea of a design is just as dangerous. Diving into code is fine for learning or prototyping, as long as you throw the code away afterward." "White boards, sketches, and Post-It notes are excellent design tools. Complicated modeling tools have a tendency to be more distracting than illuminating." Blindly picking a framework is like having kids to save taxes. Pick technology and frameworks based on statements like – "It is too hard to ..." or "It takes too long to ..."
Does it really solve the problem? Will you be tied to this technology forever? 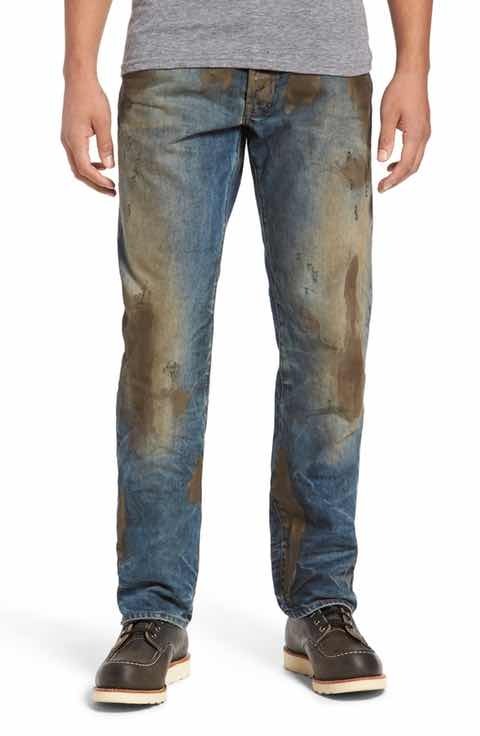 When technology changes, will you be able to change the design to match technology? "Choose technology based on need. Determine your needs first, and then evaluate the use of technologies for those specific problems. Ask critical questions about the use of any technology, and answer them genuinely." Checked-in code is always ready for action... Check out the latest source. Run your local tests. Check in. 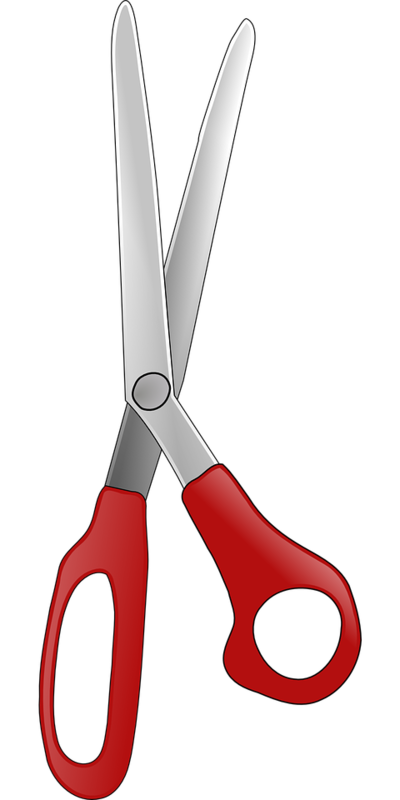 "Keep your project releasable at all times. Ensure that the project is always compilable, runnable, tested, and ready to deploy at a moment's notice." "Integrate early, integrate often.... start integration early and continue to do it regularly." "Successful integration means that all the unit tests continue to pass. As per the Hippocratic oath – first, do no harm." "For prototypes and experimental code, you may want to work in isolation and not waste effort on integration. 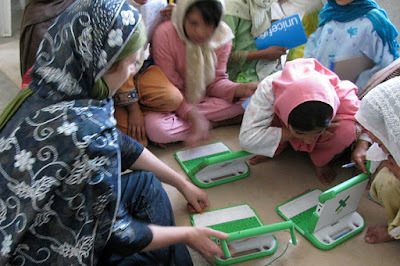 But do not stay isolated too long; once you learn from the experience, work toward integration quickly...."
Photo of young girls learning to use computers in Eastern Afghanistan, courtesy of Todd Huffman and Wikimeda Commons. I'm a journalist, so it's a given that I respect newspapers for the stories and news they provide each day. But let's be blunt. Newspapers of all sizes, by informing the community and presenting a first draft of history, also outline a path to prosperity. Information is key to investing and pursuing relationships. The most useful details and analysis on the internet often expand upon or respond to newspaper reports. As an editor of an online publication, I suspect that the internet would struggle to inform without the world's rich supply of newspapers. There is a reason newspaper journalists and their regular readers, even those who might earn relatively low salaries, tend to live comfortably and happily. They stay informed, learning to detect value and avoid risks. They minimize unpleasant surprises by quickly discovering which managers in their community are likely competent and which are inefficient bullsh--ters. Newspaper readers come to understand community trends and discern which accomplishments, whether their own or from others, are a result of good luck versus hard work. By balancing a range of opinions and reports, these readers practice critical thinking on a daily basis. Reading about a community, learning multiple points of view about every aspect of life, is invaluable before making what is for most the largest purchase they will make - their home. Newspapers offer insights about community schools, businesses, resources, courts, governance, economic climate, art and culture, crime, opinions and values and so much more. Reading about other people - accomplishments and mistakes - offers lessons for how to live. I recall numerous specific ideas picked up from newspapers and, no doubt, countless more left an influence that I do not even realize. One small example was in 1995, I had just moved to New Haven and subscribed to the New Haven Register, reading it religiously from front page to back. A guest opinion column caught my eye. A freshman at the University of California, Berkeley, expressed gratitude for the opportunity to attend New Haven Public Schools even though his family had lived in the suburbs. City schools generally have a reputation for low test scores and inadequate resources - the median income for families in NHPS is just under $36,000 - but this writer was passionate about his high school, the opportunities available in the city including enrollment in college classes and the rich diversity of the student body that delivered daily lessons in motivation, resilience and the power of education not readily found in textbooks. Though my son was in third grade, that opinion essay exposed a perspective that shaped our family's decisions on education for years to come. My son, like that guest columnist, attended New Haven Public Schools, thriving and going on to attend Yale to study biology and later degrees in mechanical and civil engineering. While one can never be certain about choices not taken, the teachers and staff were caring, and I'm confident he could not have done better in a suburban setting. Newspapers accounts likewise shaped my decisions on purchasing homes as well as selecting graduate school (an article in the Anchorage Daily News about Harvard’s Kennedy School), investments (the Wall Street Journal and Boston Business Journal), contractors, activities, and more (thank you, the Boston Globe, Richmond Times-Dispatch, Lansing State Journal and Guilford Courier). With newspapers, I have discovered ideas for decorating, cooking, reading, and preparing for any sort of event at home or work. A police blotter item from The Daily Sentinel triggered the idea for my first novel. A good newspaper saves readers money, lots of money, and I'm grateful. The media - especially the New York Times and the major broadcasters - are not an enemy for the American people, anything but. But the media do threaten the charlatans and fraudsters in any community. Journalists, covering the police blotter or the highest levels of government, learn this time and time again. Newspaper readers typically don't have to be warned about those who issue blanket warnings against journalists and, for that matter teachers, librarians, scientists, and others who inform and educate. The fraudulent can't afford to let their marks analyze details or think for themselves. 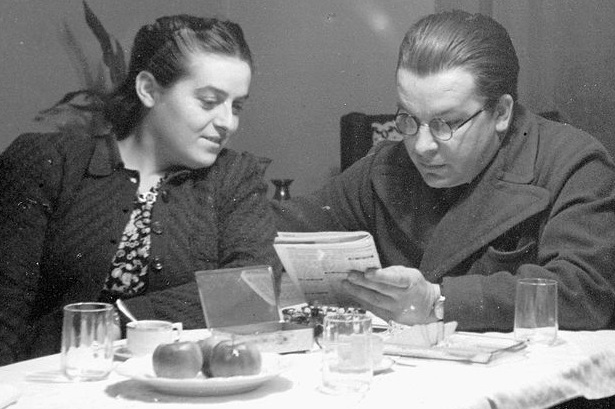 Photo of the couple by an unknown photographer in Hungary and the engraving by W. Taylor, courtesy of Wikimedia Commons and Wellcome Images.